Happy spring! Happy Mother’s Day. Happy month of Mary, everyone’s Blessed Mother. 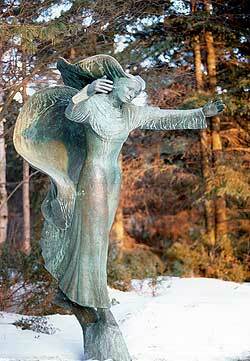 This picture shows an outdoor bronze state commissioned by Madonna House in Combermere, Canada, and designed and accomplished by the late sculptor Frances Rich. This statue is called OUR LADY OF COMBERMERE. The statue shows Our Blessed Mother running to wrap her arms around those of us, her children whom she loves. This Catholic Family column has some thoughts originating from Madonna House, and I just love this statue. Here we go with the May column. “I heard a little voice pierce through my black cloud of anger: “Hep oo, Mom?” My little toddler was looking up at me, reaching out to me in an embrace. I held him close, and felt a sudden calm. The book MOTHERING is produced and printed by Madonna House Publications out of Combermere, Canada. You can find them on-line. I shared the little story to help pose a Mother’s Day question for the Mothers who, from time to time feel the need to just go inside a bedroom (with no one following or banging on the door after two minutes) — and just quietly decompress. “Let us ask the Lord to show women today the fullness of the life at Nazareth. Pray that He might lift the veil of years and sentimental piety… and present His own mother as she really was — a housewife, a mother, a spouse, a woman busy at the sublime creative work of the ‘kingdom,’ which was His home on earth… Instinctively we imagine their Nazareth house to be spotless.” But was it? Who could keep a home in a desert spotless? Dustless? Immaculate? In what ways might Mary have been holy there in Nazareth? This month, we Catholics have, among other things honored May as Mary’s month. We’ve lifted her on a pedestal. But I think her holiness, in part came from seeing that her work in Nazareth was that of making the Kingdom of God a practical prayer of feeding the hungry where she was. And where she was was in her home. Bread making, preparing vegetables for meals, sweeping, cooking… these were her prayers, offered that she might serve out her vocation with a God-given dignity. It’s not something that the world at large understands. So don’t look for any recognition there. But turn to Blessed Mother Mary, to Her Son, and to the writings of the Church, especially Blessed John Paul II. As a matter of fact, over twenty dioceses of the Catholic Church have sponsored and promoted the program called ENDOW — Educating on the Nature and Dignity of Women. It’s a program that teaches about the dignity of women (and mothers!). I’m familiar with this from the Denver Archdiocese where it started. Within the diocese, many parishes have started the program and it has brought women to a heightened awareness of radical dignity. God’s plan for the dignity of women. And so that I am clear — ENDOW isn’t a program that attempts to persuade a woman that peeling potatoes is the foundation of her dignity. ENDOW uses the teachings of JPII (and others) to help establish that a woman’s dignity is from God, and it can be found in the boardroom or in the kitchen. Wherever a woman (or a mother) serves is where her dignity and her prayerfulness can blossom. Happy Mother’s Day. And to Blessed Mary, our Mother, I pray for all women who live and serve as humbly and as gracefully as you did. Before I even read a word of your article I saw the statue and thought “She’s running to catch me in her arms.” I’ve never seen this particular statue and now it’s one of my favorites. Thanks for sharing Deacon Tom. Do you know anything about the ENDOW program called Girls Genius? I saw it on the ENDOW website, but would like to hear from someone who has seen the study and format.